← When Did I Become A Comic Book Fan? My recent foray into Alt*Hero comics left me with a hankering for some new hard-copy sequential art to enjoy, and one of the better purveyors of said artistic style is Alterna Comics. They’ve done a masterful job threading the Charbdyis of fans of SJW comic publishers (Marvel and DC) and the Scylla of fans of reactionary comic publishers (Arkhaven and D&C). Granted, I’m a member of Team Scylla, but you have to give some respect to an apolitical outfit like Alterna that refuses to be sucked into the ongoing cultural war and instead focuses on content and sales. Their business model depends on short run series printed on traditional comic stock paper with traditional art styles and coloring, and they deliver each title for less than half the competition. At $1.50 per issue, picking up a series or two was a low risk gamble. Trespasser, a four-issue series written by Justin M. Ryan with art by Kristian Rossi and lettering by DC Hopkins, follows a single father trying to raise his young daughter in the midst of an unspoken apocalypse. The hows and whys of the end of the world are left vague. No clear explanation is given, but the small details of dead cars full of bullet holes left to languish in a barn, the unremarked vestigial limbs of the adopted family dog, and the need to check one’s food with a Geiger counter all paint a bleak picture for our protagonists. The dreary monotony of the constant struggle for survival shatters when one of the farmer’s snares catches an unexpected visitor – a gray alien whose capture sets in motion a series of unfortunate decisions for the farmer and his daughter. The story that follows is grim and weird in the best traditions of the Outer Limits or The Twilight Zone with all of the heart and authentic character moments amid the confusion that made those shows so entertaining. Like those low budget shows, Trespasser eschews action and adventure for the character drama, suspense, and mystery, with only a few glimpse of the adventure to be found in the wider world beyond. The art of Trespassers conveys a sense of loneliness and dread throughout the tale, and the verbalized information dumps as the farmer and his daughter talk to themselves work well. Instead of a clumsy method of exposition, they serve as a reminder that the farmer and his daughter are alone, have been for a long time, and aren’t entirely sane by our pre-armageddon standards. 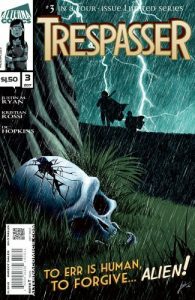 Despite its efficient storytelling, The Trespasser’s ending feels a little rushed, with a final resolution that skips over an incredible story that this reader hopes will be fleshed out in a subsequent series. At six bucks for the entire run, this series costs less than some single glossy issues by the power studios, and it delivers far more entertainment in its pages than its price warrants. It’s also available in an omnibus through Amazon. I’m looking forward to reviewing the other series ordered at the same time as Trespassers, a more light-hearted comic aimed at a younger audience, Lilith Dark. I also enjoyed this series enough that I plan to pick up more titles from Alterna, specifically Mother Russia. Available through Alterna Comics’ ETSY store, you can also order them from your local comic book shop as well.